The Portland Art Museum approached the Center for Public Interest Design about creating an exhibit around an architectural response to houselessness in Portland utilizing plywood to run parallel with the exhibit, Quest for Beauty: The Architecture, Landscapes, and Collections of John Yeon. Yeon’s incredible life and work included investigations into affordable housing in Portland through pioneering uses of plywood, a product with origins in Portland. Today, similar visionary thinking is needed to address the houseless crisis in Portland and around the country. 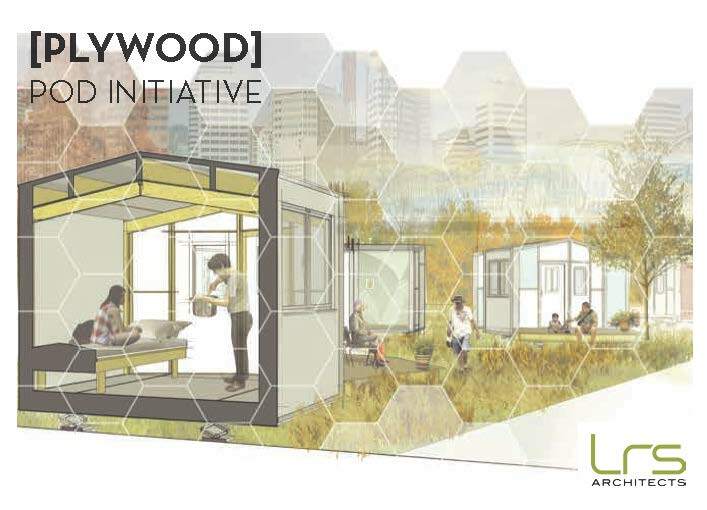 The POD Initiative organizers, led by the Center for Public Interest Design and Communitecture, are partnered with the John Yeon Center and Portland Art Museum to: generate innovative pod designs that can benefit houseless Portlanders; advance a dialogue aimed at changing public perceptions of houselessness in Portland; and discuss architecture’s critical role in addressing complex social, economic, and environmental issues. 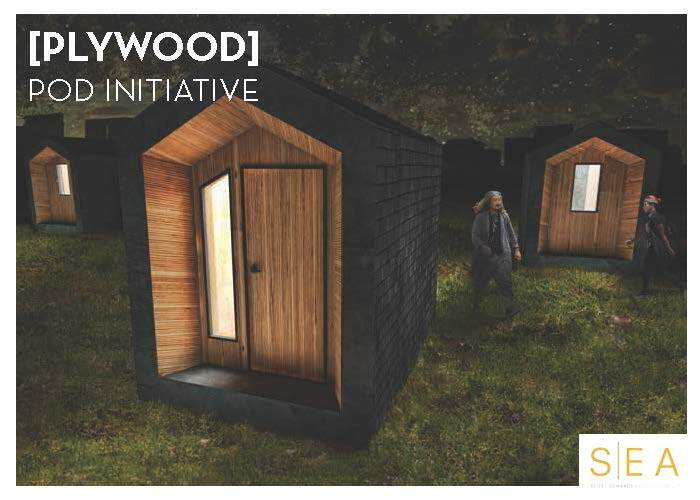 This effort aims to build on significant steps made by the architecture community in the POD Initiative’s inaugural effort in the fall of 2016, which brought together designers and stakeholders in the houseless community to design and build fourteen micro-housing units called “sleeping pods” through a collaborative process that has resulted in new initiatives on houselessness by the City of Portland. 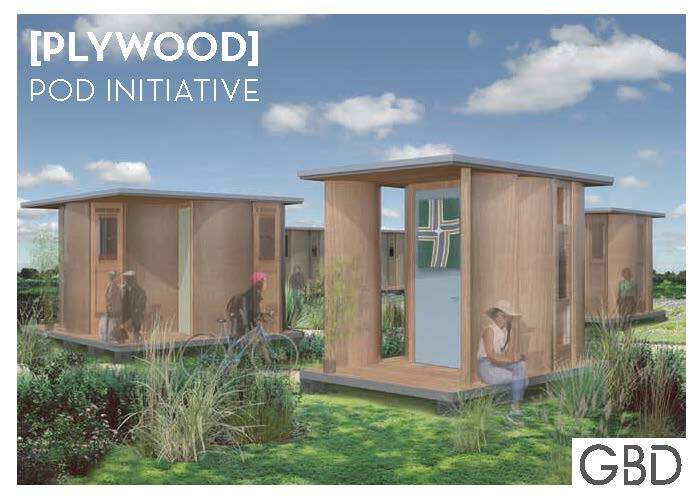 The [Plywood] POD Initiative asks architects and designers located in Portland and the Pacific Northwest to explore innovative new strategies which take advantage of plywood’s inherent properties toward beautiful and dignified transitional housing for the houseless. 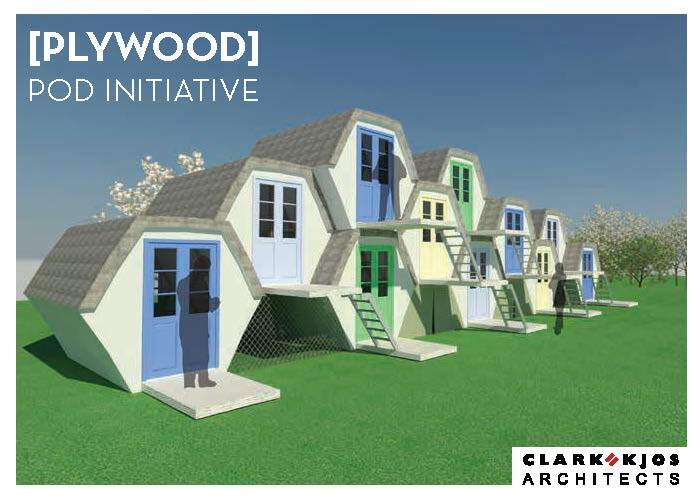 The 15 designs submitted fit the parameters of “sleeping pods,” which are designed to form a village in their aggregation with shared amenities like kitchens and showers. 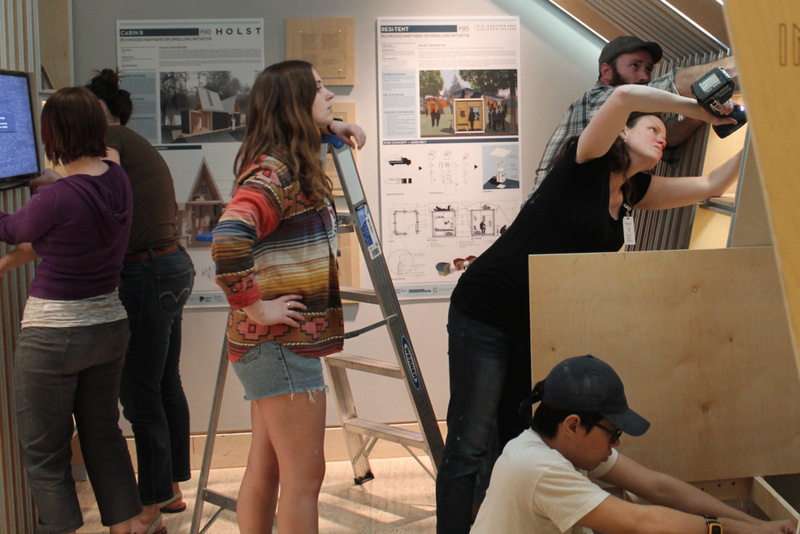 Participating teams submitted their designs on 24”x48” boards, which were then reviewed by the POD Initiative organizers and representatives from the houseless community for inclusion in the exhibit. 6 boards are highlighted at any given time (rotating), while all of the submissions are featured in a video slideshow within the exhibit and represented on accompanying outreach material. 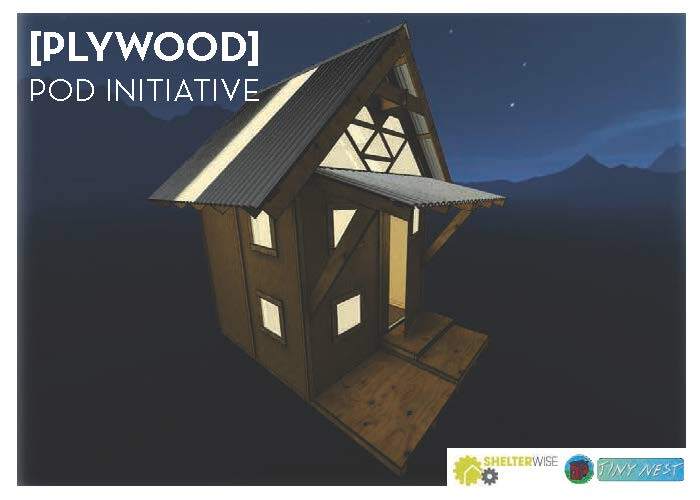 Following the exhibit, all submitted drawings will become an open resource for the public and houseless advocates like the Village Coalition, a group of advocates, activists, and houseless individuals in Portland committed to combatting houselessness from many sides of the issue. 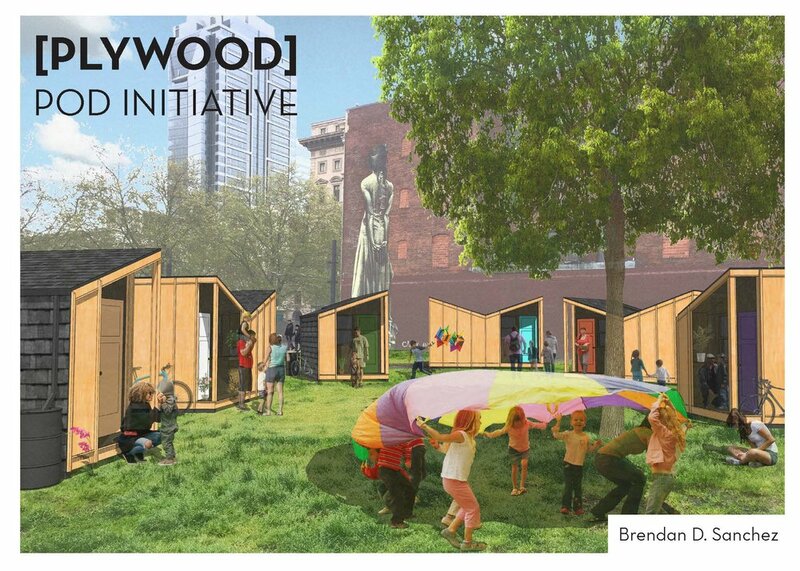 On August 20th, one pod design (TBD) will be constructed at the Portland Art Museum before being moved to a village to house a currently unhoused Portlander. The Portland Art Museum's exhibition Quest for Beauty: The Architecture, Landscapes, and Collections of John Yeon features a parallel installation created by the CPID, titled [Plywood] POD Initiative: Portland's Architecture Community Responds to Houselessness.­ This installation takes the concept of the POD Initiative one step further, with the intent of continuing the dialogue about the role of design and architecture in addressing houselessness in Portland -- this time focusing on plywood as a functional and relatively low-cost building material. Plywood was at the center of some of the influential Pacific Northwest architect John Yeon's work on affordable housing, and the very first panel of Douglas fir plywood debuted at the Lewis and Clark Exposition in 1905. 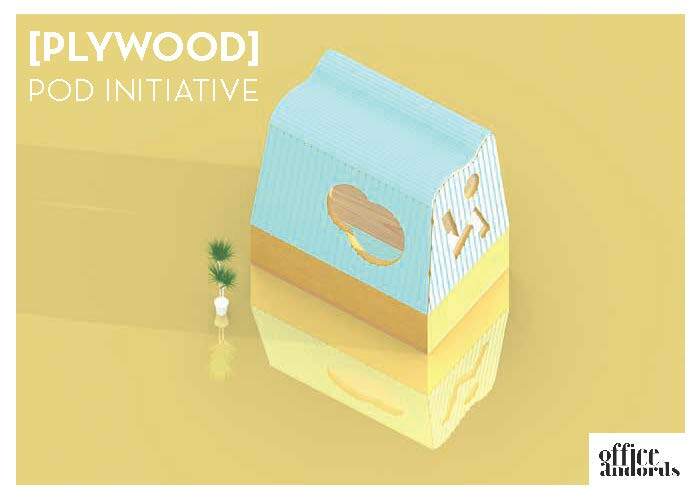 With its local legacy and history of use by John Yeon in his investigations in affordable housing, plywood was chosen to be the focus here. Fifteen design submissions by architecture firms and community groups are represented in this installation, each one of them using plywood as its primary building material. The installation was designed and built by Todd Ferry, with students Olivia Snell, Brendan Murphy, Danette Papke, Rosemary Hill, Heather Peterson, and Aung Kyaw Zin. 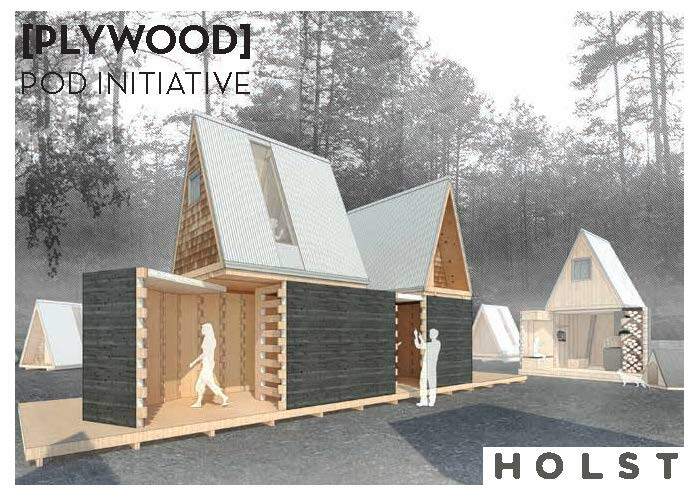 The team determined that the main design goals for the installation was to: highlight architecture's ability to make significant social impact; amplify the voices of houseless partners that serve as experts and collaborators on the CPID's work addressing houselessness; emphasize the possibilities for plywood in itself; and create a design that could be reused to benefit the houseless community at the conclusion of the exhibit. The final exhibit makes the most of a small gallery space, creating a sense of enclosure (and structure for future use) with a 3-layered plywood rib system, with connections revealed in blue at the joints. LED lighting is integrated into the middle layer of recessed plywood, as well as under shelves, illuminating models, photos, books, and information below. Black and white portraits taken by Tomasz Low feature residents of Hazelnut Grove, the Village Coalition, and POD Initiative organizers with accompanying quotes on transparent acrylic panels mounted on plywood. 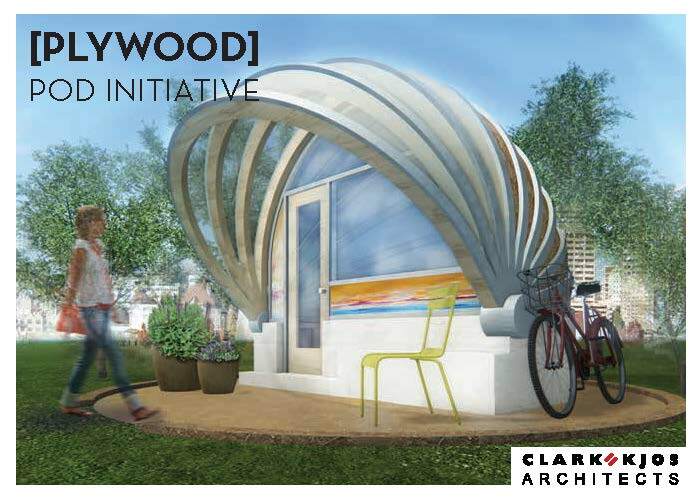 A solid bench of laminated plywood celebrates the beauty of plywood's layering and seems to wrap around the gable ceiling to hold a screen for the bench user to learn more about the initiative and houselessness in Portland. This space was designed to become a small library for the Kenton Women's Village when the exhibit closes in September 2017. Special thanks to our amazing partners at the Portland Art Museum: Stephanie Parrish, Mike Murawski, Matthew Juniper, and Jon RIchardson. 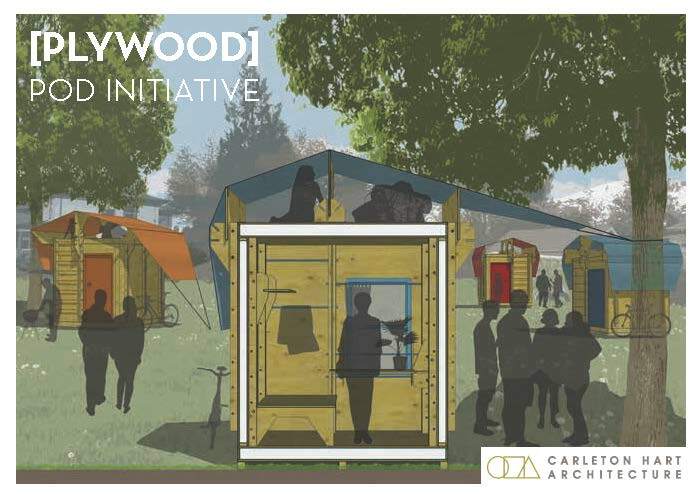 In response to a declared state of emergency on homelessness in Portland, the CPID began working with design partners in the Village Coalition like Mark Lakeman to form The Partners On Dwelling (POD) Initiative. 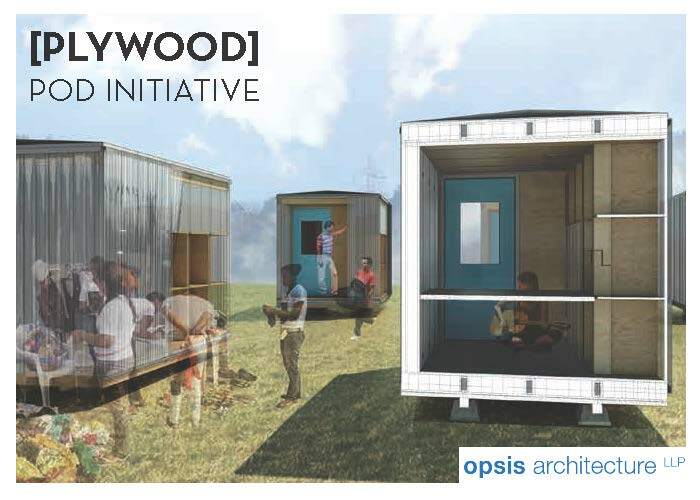 The POD Initiative recognizes that: a) informal “villages” being established by the houseless themselves are vibrant, safe, supportive, and successful self-governing communities that can serve as a replicable model. 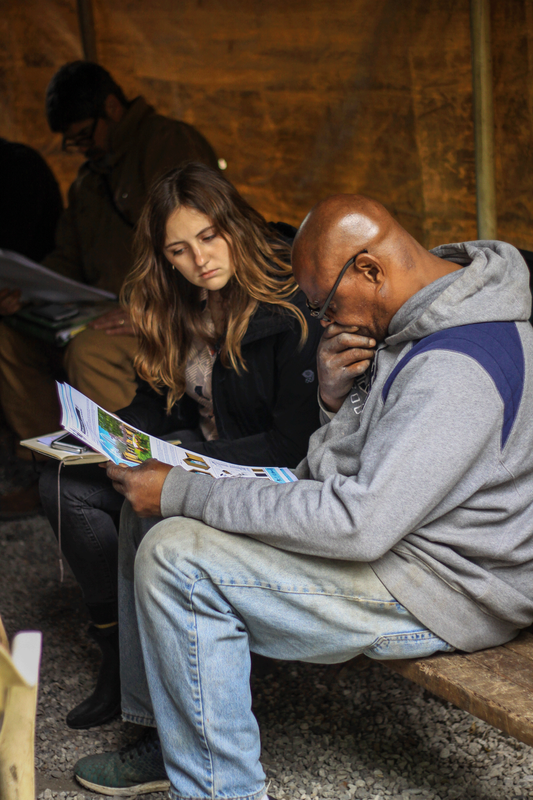 b) Design is an unmet need that has a significant role to play to aid these efforts and those of the Village Coalition. 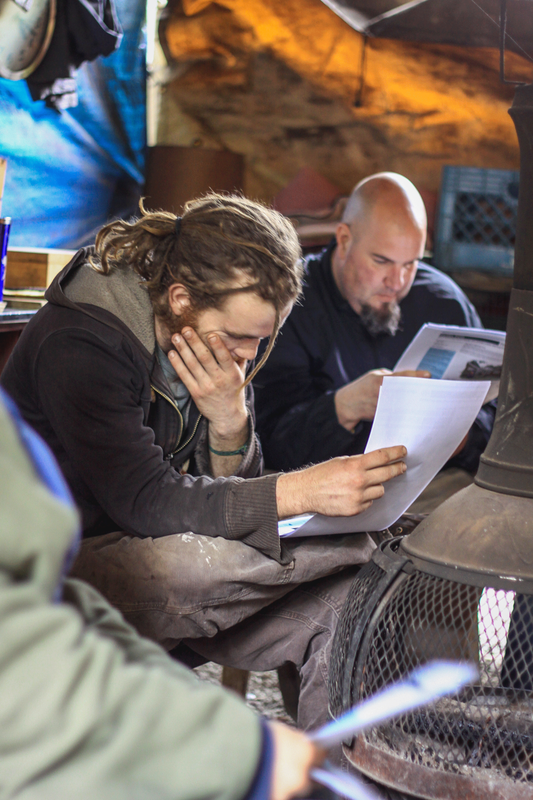 c) Initiatives to change perceptions about houselessness among Portlanders are essential for the success of any effort that intends to integrate houseless communities into Portland’s neighborhoods. 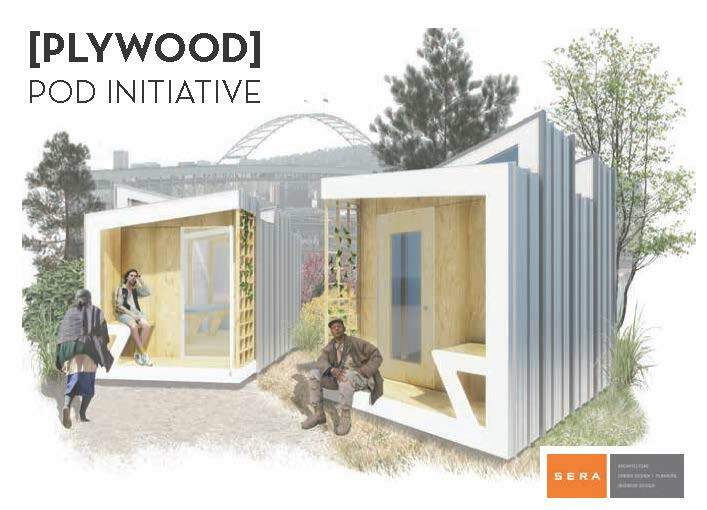 The POD Initiative aims to continue to activate Portland’s design community to address houselessness in our city. 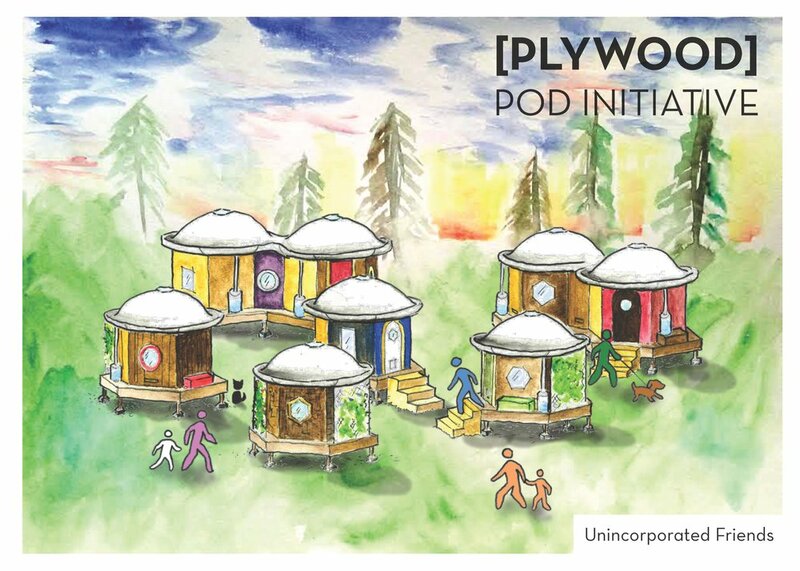 The designs created for the [Plywood] POD Initiative will inform- and may be constructed at- new villages currently being planned and designed. 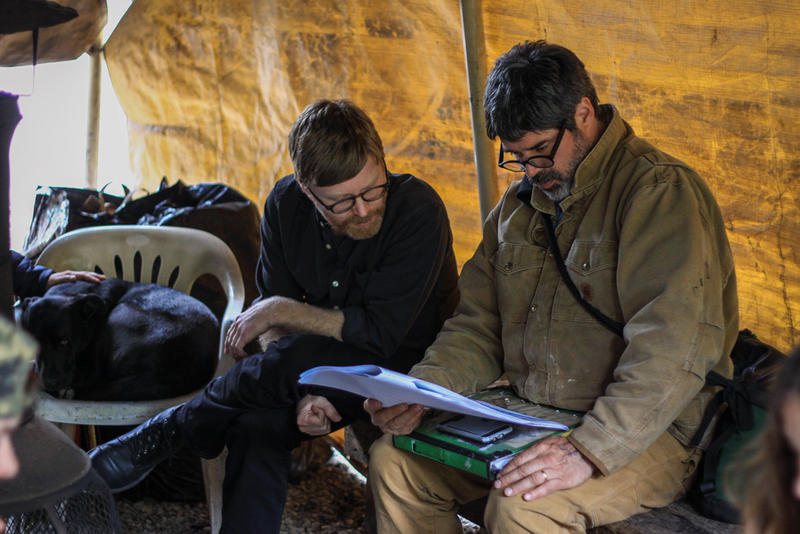 We look forward to working with the designers that have contributed to this initiative to determine how we can work together to use the power of design to serve those who need it most.